Background: Ultraviolet (UV) radiation causes photoaging in human skin. Phytochemicals from herbs have been used to treat various skin problems. Bioconversion of phytochemicals can increase efficacy and absorption rate by fermentation. Objective: The aim was to evaluate the anti-wrinkle of enriched-baicalein Scutellaria baicalensis (baicalin) was bioconverted by fermented with Leatiporus sulphureus (enriched-baicalein). Materials and Methods: Bioconversion of baicalein from baicalin were analyzed by high-performance liquid chromatography. The effect of enriched-baicalein on matrix metalloproteinase (MMP)-1 and procollagen production was examined in neonatal human dermal fibroblasts (HDFn) using ELISA, and then the effect of enriched-baicalein on wrinkle formation, skin thickness, and changes in collagen fibers were evaluated in hairless mice by histological analysis of their skin. Results: In vitro enriched-baicalein reduced UVB-induced MMP-1 production and promoted procollagen synthesis. In vivo, enrich-baicalein inhibited UVB-induced wrinkle formation, epidermal thickening, and damage to collagen fiber. Conclusions: These results suggest that enriched-baicalein has the potential to prevent wrinkle formation by inhibition of MMP-1 and promotion of Type-1 procollagen in HDFn, and by inhibition of skin thickness, and changes in collagen fibers in UVB-induced mice. Abbreviations used: MMP-1: Matrix metalloproteinase; HDFn: Neonatal human dermal fibroblasts; HPLC: High performance liquid chromatography; MTT: 3-(4,5-dimethylthiazol-2-yl)-2,5-diphenyltetrazolium bromide; DMEM: Dulbecco's modified Eagle's medium. 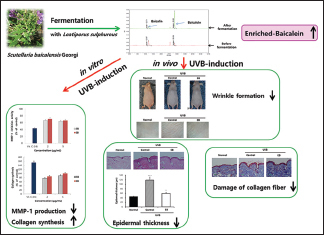 Enriched-baicalein inhibited UVB-induced wrinkle formation, epidermal thickening, and damage to collagen fiber in hairless mice. Skin aging is a natural process characterized by progressive structural and physiological changes in the skin. Striking changes occur in the dermis, such as massive deposition of abnormal elastic fibers, collagen degeneration, and loss of hyaluronic acid. Skin aging comprises several natural processes, which are predominately genetically determined, and extrinsic aging that is typically associated with sun exposure; however, other factors may be involved in extrinsic skin aging, including ultraviolet (UV) irradiation, excessive alcohol consumption, and environmental pollution. UV irradiation damages skin cells through photochemical generation of reactive oxygen species that damage nucleic acids, lipids, and proteins, including collagen. Many of these alterations in the extracellular matrix are mediated by the matrix metalloproteinases (MMPs), and MMPs are involved in extracellular matrix remodeling and play important roles in morphogenesis, angiogenesis, arthritis, skin ulceration, tumor invasion, and photo-aging., Development of new anti-aging products is, therefore, a major endeavor for cosmetics companies, with promising treatments based on herbal extracts being particularly attractive. Various antioxidant compounds have been tested to determine their ability to protect the skin from photo-aging. In Radix Scutellaria baicalensis Georgi, flavonoids with O- di-hydroxyl group or O-three-hydroxyl group or in Ring A, such as baicain and baicalein, etc., could be good free-radical scavengers. Baicalin which is glycoside and active component of S. baicalensis Georgi has low bioavailability and absorption rate in the body. Conversion of baicalin into baicalein as aglycon form can increase efficacy and absorption rate by fermentation. In the present study, enriched-baicalein was prepared from S. baicalensis Georgi fermented with Leatiporus sulphureus and profiled by high-performance liquid chromatography (HPLC). The inhibitory effect of enrich-baicalein on MMP-1 expression and collagen synthesis was investigated in vitro. Furthermore, the effect of enrich-baicalein on wrinkle formation, skin thickness, and changes in collagen fibers was examined in hairless mice. S. baicalensis (Jechon, Korea), Dulbecco's modified Eagle's medium (DMEM), fetal bovine serum (FBS), penicillin-streptomycin, phosphate-buffered saline (PBS) from WelGENE (Daegu, South Korea), trypsin-ethylenediaminetetraacetic acid (Gibco, BRL., Rockville, MD), dimethyl sulfoxide (DMSO), Ethanol (EtOH) (Daejung, Gyonggi-do, South Korea), L. sulphureus var. miniatus (KFCC 11494P, Korea), and Tecan microplate reader (Mannedorf, Switzerland) were used. All reagents were purchased from Sigma-Aldrich (St. Louis, MO, USA) unless otherwise stated. S. baicalensis Georgi was purchased from the Jecheon oriental medical herb shopping mall (Jecheon, Korea) and sliced into small pieces and homogenized. The homogenate (~200 g) was mixed with 1.5 L of distilled water and autoclaved followed by cooling to room temperature before centrifugation at 10,956 g-force for 20 min. The supernatant was filtered through a membrane filter (pore size, 0.45 μm) and freeze-drying and stored at −20°C until use for the microbial bioconversion reaction. L. sulphureus var. miniatus (it called as L. sulphureus CS0218) which was originally isolated from a mountainous district in Jeonnam province, Korea was obtained from the culture collection of CoSeedBiopharm company (patent pending, Deposit no: KFCC 11494P). The stock of this microorganism was maintained on a potato dextrose agar slant. In detail, the slants were inoculated and cultivated at 25°C for 6 days and finally stored at 4°C for further experiments. The seed culture was carried out in 100 mL of medium containing 10 g/L glucose, 3 g/L yeast extract, and 3 g/L polypeptone on a rotary shaking incubator at 140–150 rpm for 5 days at 25°C. The basal medium for the submerged culture of L. sulphureus was a modified mushroom culture medium containing 20 g/L glucose, 2 g/L yeast extract, 2 g/L polypeptone, 2 g/L MgSO4·7H2O, 0.5 g/L of KH2 PO4, and 0.5 g/L K2 HPO4 in distilled water. The initial culture pH was adjusted to 6.0 before sterilization. L. sulphureus was cultivated on potato dextrose broth and transferred to the seed culture medium by punching out 4–5 mm of the agar plate with a homemade cutter. The seed culture was carried out in a 250 mL flask containing 100 mL of the basal medium at 25°C for 6 days. The aqueous extracts of S. baicalensis Georgi (0.1% sol., w/v) were used as co-carbon source to convert baicalin into baicalein by fermentation with L. sulphureus. The bioconversion process was conducted in a 250 mL flask containing 100 mL of aqueous SB extracts containing 2.5 mL of seed culture broth (2 g/L yeast extract, 1 g/L polypeptone, 2 g/L MgSO4·7H2O, 0.5 g/L KHPO4, and 0.5 g/L K2 HPO4). The products of the microbial bioconversion were analyzed using HPLC (Waters) equipped with RP18 column (Optimapak C18 column, 250 mm × 4.6 mm i.d.) and a diode array detector. The column temperature was maintained at 30°C, and a mixture of trifluoroacetic acid and methanol was used as the mobile phase at a flow rate of 1.0 mL/min. The elute was detected at 280 nm. HDFn were purchased from Lonza Group, Ltd.(Walkersville, MD., USA) and maintained in fibroblast basal medium-2 supplemented with a growth kit containing 10 ml of FBS, 0.5 ml of insulin, 0.5 mL of gentamicin sulfate amphotericin-B (GA-1000), and 0.5 mL of r-human fibroblast growth factor-B (Lonza, USA). The cells were incubated at 37°C in a 5% CO2 atmosphere. nHDFs between passages 7 and 9 were used in all experiments. The cytotoxic effect of enriched-baicalein was measured by the 3-(4,5-dimethylthiazol-2-yl)-2,5-diphenyltetrazolium bromide (MTT) tetrazolium reduction assay on HDFn. Cells were plated in a 96 well plate at the density of 2.5 × 104 per well. After overnight incubation, the media was replaced with 100 μL media containing the various concentrations (50, 100, 200, and 500 μg/mL) of baicalein for 48 h. After 48 h, the media was removed and washed with phosphate-buffered saline (PBS, pH 7.4) and grown in 0.5 mg/mL MTT (prepared in PBS, filtered with a 0.2 mm membrane) at 37°C. 4 h later, the MTT reagent was removed, formazan crystals were dissolved in DMSO solution, and absorption values were read at 560 nm using a Tecan microplate reader (Mannedorf, Switzerland). The measured absorbance was normalized to the absorbance of nontreated control cells. To observation of the effect of enriched-baicalein on MMP-1 production, the experimental group was divided into two, one is UVB-nonirradiated cells, and the other is UVB irradiated (6 mJ/cm2) cells. nHDF (5 × 104 cells) were preincubated in 24-well plates for 24 h. The cells were confluent and cultured with serum-free DMEM or serum-free DMEM containing various concentration (2 and 5 μg/mL) of enriched-baicalein or L-ascorbic acid (0.6 μg/mL) for 48 h. For the UVB-irradiated group, cells were washed with PBS and exposed to UVB (6 mJ/cm2) light. After irradiation, cells were incubated in serum-free DMEM. Cells in the UVB-nonirradiated group were washed with PBS and further incubated in serum-free DMEM. After 24 h of incubation, the cell-free supernatants from those two groups were collected and used to assess MMP-1 degradation level. The effective inhibition of MMP-1 was evaluated using a colorimetric method (Abcam, Cambridge, MA, USA) by ELISA microplate reader. L-ascorbic acid was used as a positive control. HDFn (5 × 104 cells) were seeded onto 24-well plates for 24 h until they were confluent and then incubated with serum-free DMEM or serum-free DMEM containing various concentration (2 and 5 μg/mL) of enriched-baicalein or L-ascorbic acid (200 μg/mL) for 48 h. The study group was divided into UVB-nonirradiated and UVB-irradiated group. After incubation, the cell-free supernatants were collected from each well, and the collagen contents were determined using a procollagen Type-1 C-peptide assay kit (Takara Bio Inc., Otsu, Japan) with ELISA microplate reader. L-ascorbic acid was used as a positive control. HR-1 hairless male mice (6-week-old) were purchased from Japan SLC, Inc., (Shizuoka, Japan), and stabilized for 1 week before the study. The animals were housed in climate-controlled quarters (24°C ± 1°C at 50% humidity) with 12 h light/dark cycles and had free access to food and water. All experimental protocols were approved by the Korea Institute of Oriental Medicine Institutional Animal Care and Use Committee (Daejeon, Korea; approval no. 11-061). The mice were divided into control (n = 3), UVB-treated vehicle (n = 3), and UVB-treated rich baicalein (n = 3) groups. The rich baicalein containing 100 mg of rich baicalein/kg body weight per day, dissolved in 0.4% polyethylene glycol in 0.5% EtOH, were applied topically, on a daily basis, for 12 weeks. Drinking water was supplied to animals in the vehicle group, and the unexposed control group was not treated with any material to maintain the same start condition. The prepared samples were given to the mice 5 days a week for 12 weeks. The morphology was observed under universal serial bus Digital Microscope (×400, CE FOROHS, China), and images were recorded. For the in vivo-experiments, the same apparatus was used as in vitro-experiments. UVB radiation was applied to the backs of the mice 3 times a week for 12 weeks by previous paper. UVB radiation was applied to the backs of the mice 3 times a week for 12 weeks. Minimal erythematous dose (MED) was defined as the minimum amount of radiation exposure required to produce erythema with sharp margin after 24 h (1 MED = 60 mJ/cm2). The amount of irradiation was progressively increased from 60 mJ/cm2 (1–3rd weeks), 90 mJ/cm2 (4–6th weeks), and 120 mJ/cm2 (7th–12th weeks). Dorsal skin was fixed in 10% neutral buffered formalin, embedded in paraffin, and sectioned at 5 mm. Sections were stained with hematoxylin and eosin (H and E), and Masson's trichrome for collagen fiber analysis. The thickness of the epidermis was measured under light microscopy with an eyepiece micrometer (Olympus, Japan). All measurements were made in triplicate, and all values are represented as a mean ± standard deviation. The results were subjected to an analysis of variance using the Tukey test to analyze differences; P < 0.05 was considered statistically significant. The soybean extract was fermented with mycelium of L. sulphureus for 6 days. After fermentation, baicalein was detected only in the fermentation product by mycelium of L. sulphureus, not by other mycelium [Figure 1]a. It was confirmed that baicalein was increased from 3241.4 ppm to 18,622.6 ppm while baicain was decreased from 35,970.5 ppm to 11,833.8 ppm after fermentation [Figure 1]a. Therefore, bioconversion by fermentation increased the content of baicalein about 5.8 times. Furthermore, we evaluated the effects of the enriched-baicalein on the viability of nHDFs cells after 24 h culture. As a result, rich baicalein showed no cytotoxicity up to 500 μg/mL [Figure 1]b. To examine inhibitory effects of rich baicalein on MMP-1, cells were cultured with enriched-baicalein or L-ascorbic acid (positive control) for 48 h and then the cell-free supernatants were collected to quantify the level of MMP-1. The enriched-baicalein significantly decreased MMP-1 levels in a dose-dependent manner by 71.1% and 66.6%, respectively, at concentrations of 2 and 5 μg/mL [Figure 2]a. The positive control, 0.6 μg/mL of L-ascorbic acid, decreased MMP-1 by 43%. To evaluate the effects of enriched-baicalein on Type-1 procollagen synthesis, cells were cultured with baicalein or L-ascorbic acid for 48 h. As shown in [Figure 2]b, rich baicalein significantly increased Type-1 procollagen synthesis in a dose-dependent manner by 85.4% and 100.2% at concentrations of 2 and 5 μg/mL, respectively. 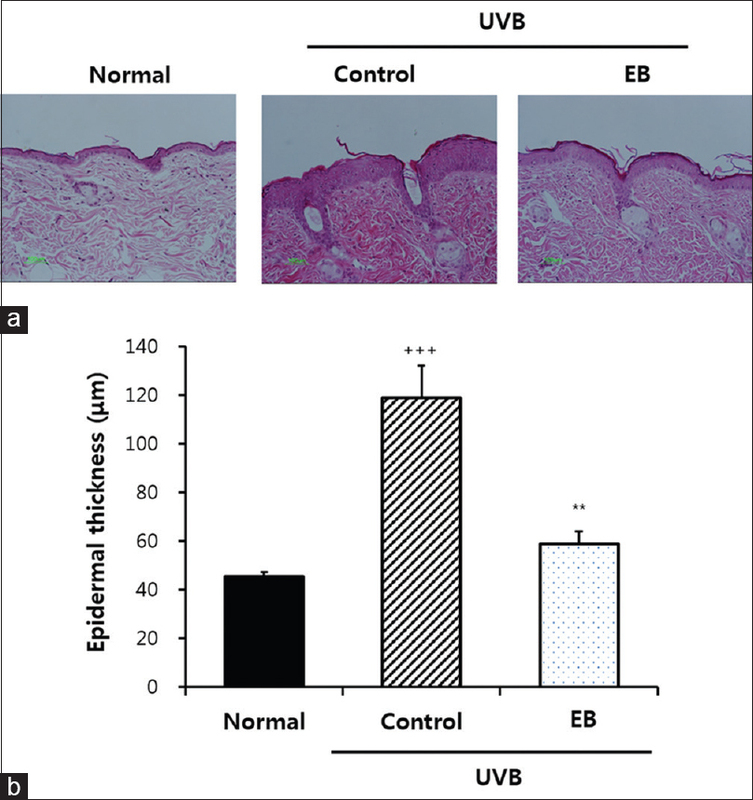 To investigate the effect of enriched-baicalein on UVB-induced wrinkle formation in vivo, we repeated UVB exposure on hairless mice skin during 12 weeks, which resulted in wrinkle formation, that was blocked by rich baicalein containing 100 mg of enriched-baicalein/kg body weight per day [Figure 3]a and [Figure 3]b. Wrinkle formation was observed macroscopically in the dorsal region of vehicle-treated UVB-irradiated mice. However, enriched-baicalein treatment on UVB irradiated mice reduced wrinkle formation. From the histological observations, the thickness of the epidermis was significantly increased by UVB irradiation as shown by the H and E staining. However, rich baicalein treatment significantly inhibited the increase in epidermis thickness [Figure 4]a. 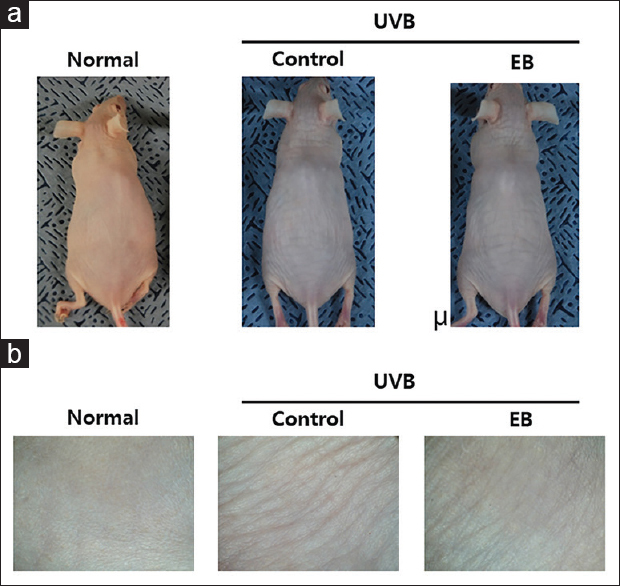 Since epidermal thickness is used as a quantitative parameter for assessing inflammation and skin photoaging, we evaluated the changes in dermal thickness in UVB-irradiated hairless mice. The epidermal thickness of the dorsal skin was significantly increased following UVB irradiation. Furthermore, epidermal hypertrophy was significantly reduced by rich baicalein treatment [Figure 4]b. To visualize changes in collagen fibers in the dermal areas, histological sections of skin were subjected to Masson's trichrome staining. The collagen fibers were stained in dermal areas. The collagen fibers (blue) in baicalein-treated skin were less damaged than that of vehicle-treated skin [Figure 5]. In addition, a marked increase in collagen bundles was observed in the enriched-baicalein group as compared to the UVB-treated group. Many antioxidants and anti-photoaging compounds that effectively inhibit skin photodamage are available. S. baicalensis Georgi, Chinese name, “Huang-qin,” has been routinely used in the treatment of bronchitis, hepatitis, allergy, atopy, inflammation, and arteriosclerosis. In radix S. baicalensis Georgi, flavonoids such as baicalin and baicalein is reportedly biologically active with anti-oxidant and anti-inflammatory effects. Baicain which is glycoside and active component of S. baicalensis Georgi has low bioavailability and absorption rate in the body. Conversion of baicain into baicalein as aglycon form can increase efficacy and absorption rate by fermentation. 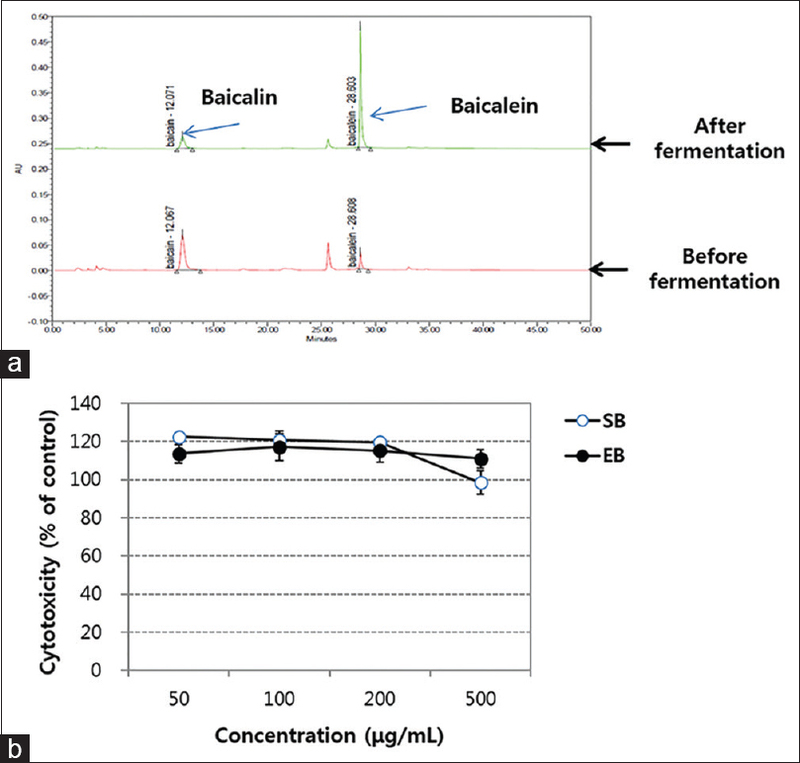 In this study, to identify baicalein from S. baicalensis Georgi fermented with L. sulphureus, an HPLC profile was performed. It was confirmed that baicalein was increased at 5.8 times while baicalin was decreased after fermentation [Figure 1]a. Therefore, the conversion of baicalin into baicalein could be increased efficacy and absorption rate by fermentation. Photoaging is related to degradation of collagen, which is regulated by MMPs. MMPs associated with extracellular matrix remodeling that plays important roles in morphogenesis, angiogenesis, arthritis, skin ulceration, tumor invasion, and photoaging. In vitro, enriched-baicalein treatment significantly inhibited the production of MMP-1 and promoted the production of the Type-1 procollagen in HDFn cells without cytotoxicity [Figure 1]-b, [Figure 2]a and [Figure 2]b. Therefore, further investigation was conducted to evaluate whether enriched-baicalein inhibits UVB-induced hairless mice. In mice, we found that UVB radiation-induced skin wrinkles in hairless mice after 12 weeks. Wrinkle formation in the UVB-irradiated group treated with rich baicalein was lower than that of the vehicle-treated UVB-irradiated group [Figure 3], [Figure 4], [Figure 5]. Based on these results, we suggest that rich baicalein may be a good candidate for a photoprotective skin care agent. Our results reveal that enriched-baicalein from S. baicalensis Georgi fermented with L. sulphureus inhibited the MMP-1 production and promoted of Type-1 procollagen in response to UVB irradiation. Rich baicalein also prevented UVB induced skin thickness, wrinkle formation, and collagen fiber loss. Our data suggest that enriched-baicalein can be developed as a candidate for skin care such as a photoprotective agent. We would like to thank Dr Sung-Wook Chae at Korea Institute of Oriental Medicine. Pedrosa TD, Barros AO, Nogueira JR, Fruet AC, Rodrigues IC, Calcagno DQ, et al. Anti-wrinkle and anti-whitening effects of jucá (Libidibia ferrea mart.) extracts. Arch Dermatol Res 2016;308:643-54. Delalle-Lozica N. Local therapy as basic anti-aging prevention. Acta Clin Croat 2010;49:529-36. Im AR, Kim HS, Hyun JW, Chae S. Potential for tyndalized Lactobacillus acidophilus as an effective component in moisturizing skin and anti-wrinkle products. Exp Ther Med 2016;12:759-64. Ezzat SM, Salama MM, ElMeshad AN, Teaima MH, Rashad LA. HPLC-DAD-MS/MS profiling of standardized rosemary extract and enhancement of its anti-wrinkle activity by encapsulation in elastic nanovesicles. Arch Pharm Res 2016;39:912-25. Birkedal-Hansen H. Proteolytic remodeling of extracellular matrix. Curr Opin Cell Biol 1995;7:728-35. Fisher GJ, Datta SC, Talwar HS, Wang ZQ, Varani J, Kang S, et al. Molecular basis of sun-induced premature skin ageing and retinoid antagonism. Nature 1996;379:335-9. Pinnell SR. Cutaneous photodamage, oxidative stress, and topical antioxidant protection. J Am Acad Dermatol 2003;48:1-9. Olennikov DN, Chirikova NK, Tankhaeva LM. Phenolic compounds of Scutellaria baicalensis Georgi. Russian J Bioorganic Chem 2010;36:816-24. Xu C, Ji GE. Bioconversion of flavones during fermentation in milk containing Scutellaria baicalensis extract by Lactobacillus brevis. J Microbiol Biotechnol 2013;23:1422-7. Nielsen IL, Chee WS, Poulsen L, Offord-Cavin E, Rasmussen SE, Frederiksen H, et al. Bioavailability is improved by enzymatic modification of the citrus flavonoid hesperidin in humans: A randomized, double-blind, crossover trial. J Nutr 2006;136:404-8. Borden P, Heller RA. Transcriptional control of matrix metalloproteinases and the tissue inhibitors of matrix metalloproteinases. Crit Rev Eukaryot Gene Expr 1997;7:159-78. Kim HS, Song JH, Youn UJ, Hyun JW, Jeong WS, Lee MY, et al. Inhibition of UVB-induced wrinkle formation and MMP-9 expression by mangiferin isolated from anemarrhena asphodeloides. Eur J Pharmacol 2012;689:38-44. Gilchrest BA. A review of skin ageing and its medical therapy. Br J Dermatol 1996;135:867-75. Pandel R, Poljšak B, Godic A, Dahmane R. Skin photoaging and the role of antioxidants in its prevention. ISRN Dermatol 2013;2013:930164. Kumagai T, Müller CI, Desmond JC, Imai Y, Heber D, Koeffler HP, et al. Scutellaria baicalensis, a herbal medicine: Anti-proliferative and apoptotic activity against acute lymphocytic leukemia, lymphoma and myeloma cell lines. Leuk Res 2007;31:523-30.